This ecoreserve is fortunate to be relatively isolated due to being surrounded either by private property or steep topography, and the absence of existing roads or trails. Also, there are no panoramic views on any summits within the reserve. As a result, visitation is limited to infrequent recreational hiking by nature enthusiasts, and human impacts are very low. No hunting is allowed on Bowen Island’s public lands. The threats that exist elsewhere on the island, such as mountain biking and ATV/4×4 riding have not arrived on the reserve’s doorstep yet. However, these uses are increasing elsewhere on the island, so vigilance needs to continue. Invasive species have not been assessed, although the risk is considered low so far due to the very low visitation. A residential subdivision is proposed on previously logged private property to the south (The Benchlands, part of the Cowan Pont development); it is down-gradient from the reserve. The development activity has been very slow to date, limited to roughing-in a roadway along a former logging track between 2002 and present. There is a risk that, eventually, the Benchlands may become an access point for mountain bikers and ATV riders. An earlier phase of the Cowan Point project, which backs onto the west boundary, has not resulted in any incursions or damage to date. 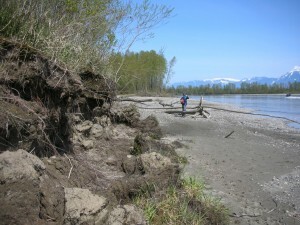 The reserve is not being used for research: it remains as an untouched reservoir of relatively low elevation maritime inland flora and fauna that can serve as benchmark or control for comparison with other areas in the lower mainland. Probably the main issue at present is the potential for a change in ownership. Parks Canada (PC) is conducting a feasibility assessment to possibly establish a National Park Reserve on Bowen Island. The current park concept (version 2.0) include all or most of the Crown lands, the ecoreserve, Apodaca Provincial Park, Crippen Regional Park and some though not all of the Islands Trust Fund nature Reserves and Municipal parks. PC has indicated that any existing management plans (e.g., ecoreserve, Apodaca Park) would continue under PC management. This is an issue to watch over the next few months/years. dog impact on Cutthroat Creek. The park has done a fairly good job of fencing it off, but dogs still get in the creek. This short section of the creek has the spawning gravels. I thought the trout population had died off, but saw a fish a few months ago, so they are still surviving. The numbers, though, I suspect are probably very low. need to clarify management through an agreement with Metro Vancouver Parks? unauthorized camping, largely by people fishing during sockeye salmon runs in late August. Camping occurs mostly along gravel shoreline of upper islands on the southeast side, with some fire pits, some garbage but overall not much impact. This camping would be extremely difficult to forbid, and possibly no ecological reason to do so? In the past a grow-op was found with much infrastructure (watering pipes and water reservoir); with assistance from BC Parks staff and boat, equipment was removed. Another issue a few years back was extensive harvesting of straight stemmed equisetum (horsetail) for sale to commercial florists (stems had to be 24” and longer), but this use seems to no longer occur. as site had more phantom orchids when kept clear by grazing, might be interesting to try creating a small clearing of the regenerating brush next to the orchid sightings. It will be a long process for the site to regenerate from field to mature forest. In the meantime, numbers of orchids occurring in the regenerating brush are low. difficult to access reserve as island in the river; wardens have not been there for a few years. Previously BC Parks did invite warden during one of their occasional helicopter tours to the island; or occasionally access was provided by other contact via raft. Would appreciate discussing with BC Parks staff assistance in accessing the reserve. Apologies that 10 day work week schedule did not allow him to join the field trip. No known warden; Nature Conservancy of Canada does check on site? Need clarification on who warden is. ← Riccia frostii, a new find on the Sandbars of the Fraser River Islands.